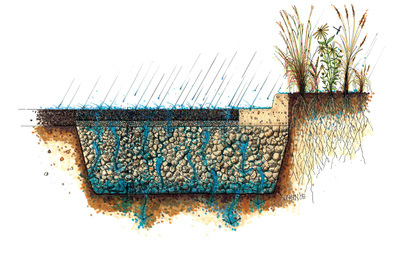 Low impact development (LID) is a stormwater management strategy that uses natural features to capture, treat, and infiltrate water into underground aquifers. LID systems comprise best management practices (BMPs), such as rain gardens and bioswales, designed to detain and treat stormwater on-site. 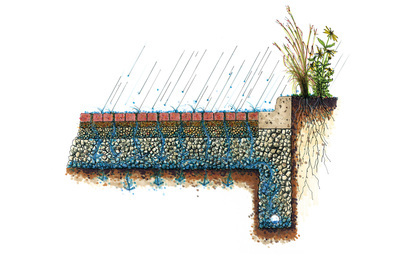 In addition to improving groundwater infiltration, effective BMPs improve surface water and groundwater quality by filtering pollutants and bacteria from stormwater. 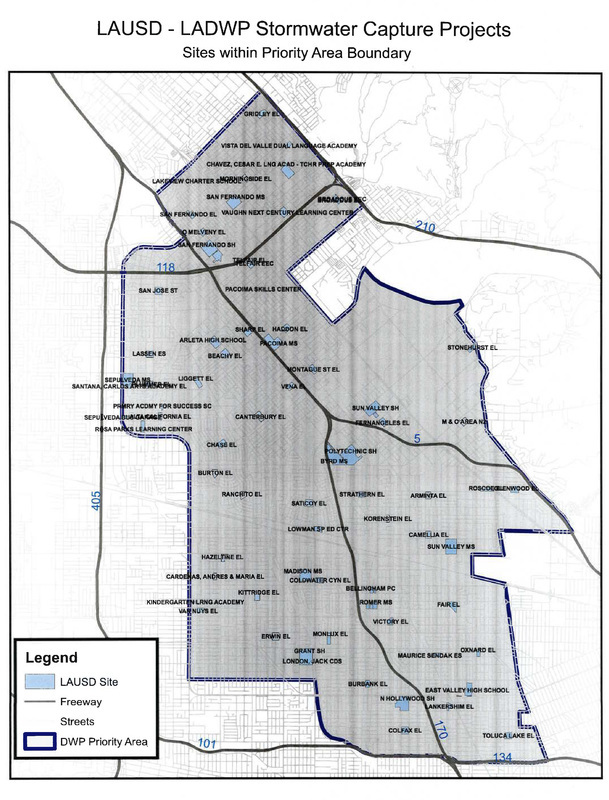 Through the state-funded Drought Response Outreach Program for Schools (DROPS) and Proposition 84, six LAUSD campuses were selected by the State Water Resources Control Board (SWRCB) to receive $6 million in funding for low impact development (LID) projects to be implemented over a 3-year period. The schools were selected for consideration through the Maintenance & Operations' Critical Repair program, targeting schools that were scheduled for asphalt and other site repairs. While the LID projects vary at each campus, the purpose of the systems is to capture, treat, and infiltrate storm water into groundwater basins mimicking a natural watershed. 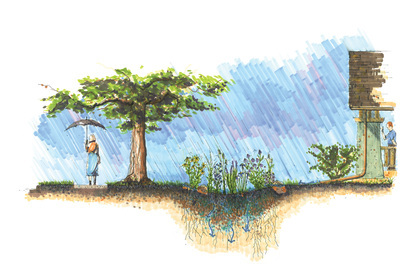 This goal will be accomplished through the implementation of Best Management Practices (BMPs) such as bioswales, permeable pavement, infiltration galleries, rain-gardens, and cisterns. Native plants will be utilized as well. The DROPS grant requires development and implementation of a robust education and outreach component at each school. 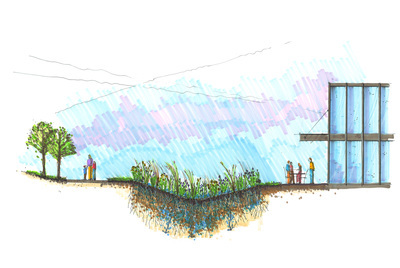 Through partnerships with the Council for Watershed Health, TreePeople, and the Los Angeles Audubon Society, the LID projects will be utilized as outdoor, experiential classrooms and learning laboratories that can be incorporated into curriculum and activities at the schools. Students will be engaged during design and construction, collaborating on aspects such as native plant selection. Additional DROPS program components include field trips, student leadership training, professional development workshops, and formation of Eco Clubs. The local school communities will be engaged through community workshops. 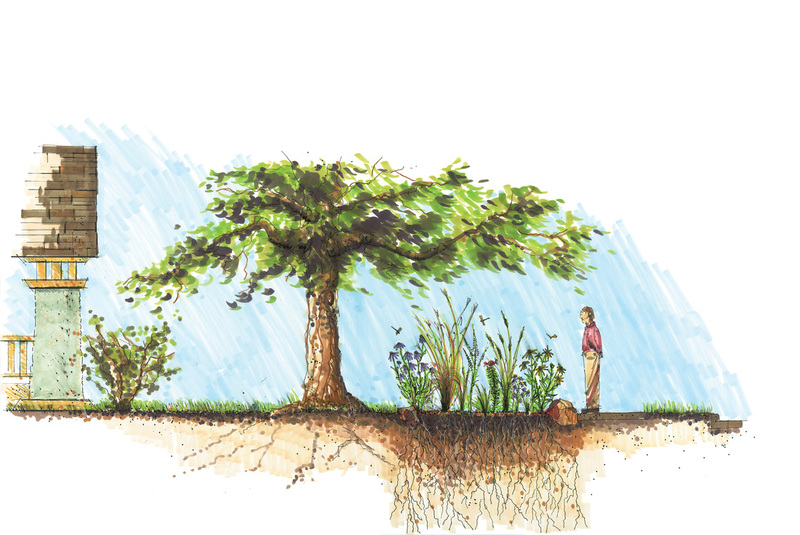 The District’s DROPS program also includes staff training for Maintenance & Operations employees responsible for managing the LID features and caring for the native landscaping. Click here for the DROPS description handout in English and in Spanish. Images from First Annual DROPS STEAM Workshop at Webster Middle School, presented by Los Angeles Audubon Society and TreePeople on May 6, 2017. Students shared about nature and the environment, and participated in activities that included water testing and birding. DROPS-related field trips to Ballona Wetlands and Kenneth Hahn Park provided by Los Angeles Audubon. 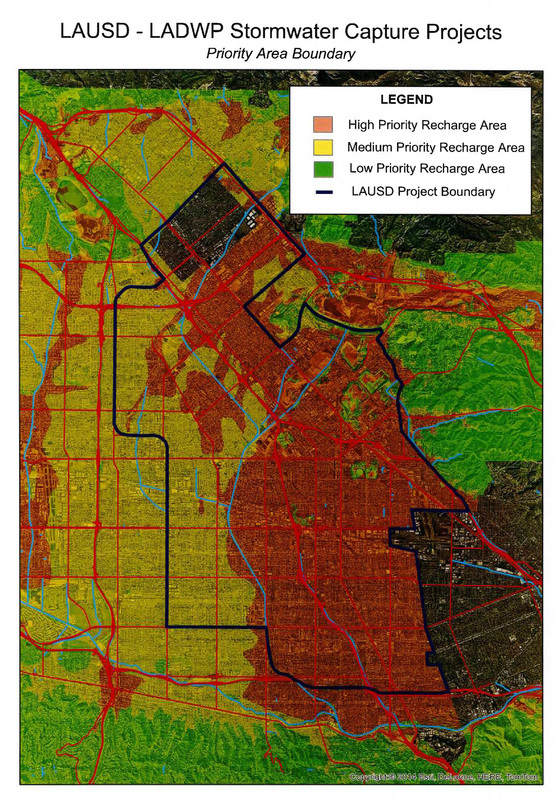 In partnership with LADWP, the District is utilizing the city-wide Stormwater Capture Master Plan to identify opportunities for stormwater capture in the northeast San Fernando Valley area.